It’s been another week of big news for the GURPS community as the Dungeon Fantasy RPG Kickstarter continues roaring towards full funding (and now has a contest on their forums, if you’d like a chance at a free copy). In addition to being a fantastic point of entry for newcomers, it is also being used to gauge interest in physical GURPS products as a whole — so, if that’s something you’d like to see more of in the future (yes, please! ), please consider at least checking it out. 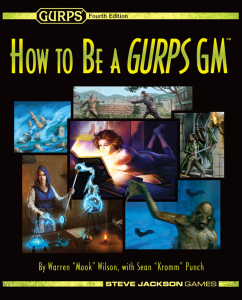 As if the rewards weren’t a crazy-great value already, Steve Jackson Games also announced a softcover print version of “How to Be a GURPS GM” as one of the AddOns! This was an amazing surprise, and I really can’t wait to get my hands on it. They posted a video of the proof copy on their Facebook page (sorry, no other source) — and, I love this cover! I am really, really hoping this Kickstarter does well, and leads to a whole new age of printed, hold-in-my-grubby-hands GURPS products. 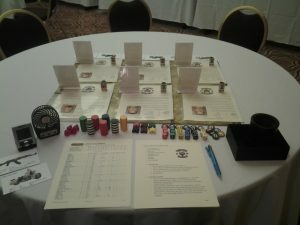 Turning now to today’s post, it is our final look at the “Hell on Wheels” convention game I ran a couple weekends ago, where I get all the notes and characters posted for download and talk a bit about how it actually ran at the table. Here’s what the setup looked like just before the players arrived. And here are all the materials for the game, in case you’d like to run the adventure yourself sometime. The entire adventure is just three pages of bullet points covering eight scenes. “The PCs are outlaw bikers who make their way out to a remote desert rendezvous, only to find that a werewolf (and her family) have messily devoured the bikers they were supposed to meet.” It might only be one sentence long, but it was plenty to fill a four-hour game and everyone seemed to have a great time (I know I did). Friday’s group had five players, Sunday and Monday both had four, and all three groups were split about evenly between those familiar and unfamiliar with GURPS. I couldn’t have asked for better players! Everyone really dove into the characters with gusto and made it a ton of fun. Primary skill was usually 16, secondary skills 12-14, so they were all very competent right out of the gate. After setting the stage with a brief intro to GURPS and the characters, the first encounter (“Pistol Pete’s”) was just a flat-out action scene to get things rolling and demonstrate the loyalty between the PCs. As written, this is an encounter with a rival biker gang, the Marauders, at a dive bar called Pistol Pete’s, and that’s how it ran on Friday. On Sunday, it was instead a drug warehouse being raided by rogue FBI agents, and Monday it was a roadside beatdown between Marauders and Roadrunners (an ally group to the PCs). I’m not sure I ever quite got this scene down the way I’d hoped, but it certainly had the desired results. By starting in the middle of an action scene, the players were immediately drawn together as a team and ready to move on to the adventure at hand. The second encounter (“Desert Run”) was basically just their club president, Jones, sending them out to the desert to pick up the monthly collection of drugs and a very important USB drive. Just a little social scene, a “lay out the mission and hit the road” kind of thing. The third encounter (“Marauders on the Highway”) was a resounding success in all three games, definitely the highlight besides the climax. In the notes it is written only as “On the way to the meet, run into a crew of 6 Marauders,” but each and every time it ballooned into a frenetic “Mad Max”-style brawl with shots ringing out, clubs cracking bones, bikers laying down their bikes in a shower of sparks, all happening at 80 mph or more on a lonely desert highway. Epic, epic fights. The fourth encounter (“AZ Highway Patrol”) played out as I thought it would twice — the PCs got pulled over by a pair of Highway Patrol, hassled a bit, but the bikers kept their cool and were sent on their way. Only one group decided it was a better idea to just take out the cops and hide the bodies in the desert. With some groups, that’s just the way it goes when playing a pack of borderline psychotic degenerates! I made a complete entry for the fifth scene (“Nighttime Cruise”) to make sure I remembered to describe it. I thought it was important to have a moment of quiet bonding for the characters, just a quick little scene to establish the in-game feeling of camaraderie that led them all to become biker brothers in the first place. Literally just a 30-second calm before the storm of reaching the meet. In the sixth encounter (“Carnage”), the PCs reach the meet after all their misadventures and discover that all the people they were supposed to meet have been ripped to pieces by… something. This was the start of the big finale that lasted through to the end. All three groups checked the bodies and found the USB drive they needed to recover (as well as the monthly drug pick-up), and two of the three discovered the crate of AK-74s in the back of the van in time to use the weapons against the soon-to-be-seen werewolf (the third group had a much tougher time with that fight!). The seventh encounter (“Skinwalker”) was a full-on combat against a “werewolf.” Technically, in my mind, the creatures were Skinwalkers, but that was just a detail I noted in case it ever came up in the story. It never did, so calling them werewolves was easier. The monster did manage to wound a couple of characters pretty seriously, but there ended up being no PC deaths at all! I used the eighth encounter (“Pack’s Revenge”), where the lone werewolf’s three family members show up in response to her howls of pain, for the two groups that found and armed themselves with the AK-74s, leading to even more wonderful claw and fang and bullet mayhem. For the group that had a seriously tough time just getting the one monster down (using only handguns and melee weapons), they escaped back to the highway leaving the angry howls behind them — otherwise, it likely would have been a massacre (and not the good kind). Judging by all the hoots, hollers, and laughter at the tables, I’m calling this con a complete success, three out of three great games! You can read about the game prep in other posts. Mechanically, it wasn’t much different than most of my games — a bullet point adventure with some enemy stats, six pre-gen characters with simplified GURPS cheat sheets, and signs/figures/notecards as needed. 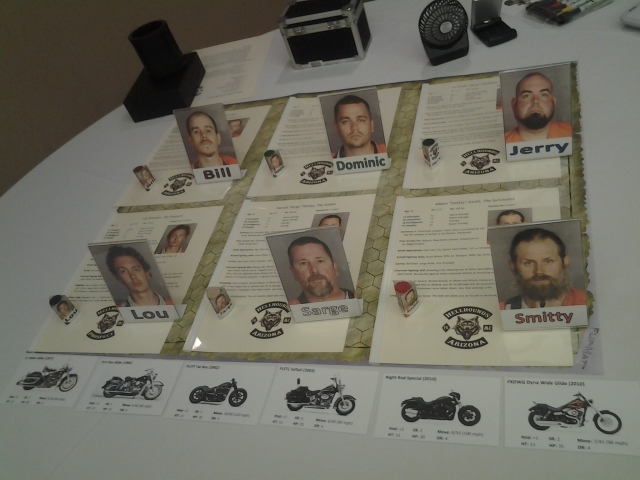 One fun part of this game I liked was that the players could choose their own motorcycle as well as their character. I’d love to hear your thoughts on “Hell on Wheels,” below in the comments or wherever. I’m a bit adrift now because the next convention isn’t for six months! But that hopefully means I can make a bit more time for Game Geekery projects. Thanks, Ben! Yeah, totally looking forward to it (and I agree, I dig the cover). OMG! It appears to have, but I don’t care. 🙂 Can’t wait to be holding an official hardcopy in my grubby little hands. What are the colors on the weapons and HP of the NPCs (p. 4 and 5)? That’s for a system I talk about here – basically, by pairing up color-coded sets of 3d6 with numbered tokens of the same color, the GM can roll 18d6 in a single throw and generate results for six characters. “The Green 3d6 are Token #2, the Black 3d6 are Token #5,” etc. Speeds large groups of combatants waaay up! Just recently discovered your blog about GURPS and I love it! Thanks for all your effort and for the huge detailed material and thoughts about gaming. Welcome, Luigi! I’m glad you’ve found some useful bits here. Good luck with the game, I’d love to hear how it goes. The session ended right now : it was a blast (and e big surprise, read more later). I briefly introduced the scenario making a strong comparison with the son’s of anarchy world, players did not know it but they had a good grasp of the whole thing. Things got messed in less than 30 minutes: the ambush in pete’s bar went great, PCs behaved very well and took down a couple of marauders making flee the others. Police was coming so the party refuged in their HQ (which was a mechanic workshop… i used many elements of SOA for the background). After few weeks the Roadrunners went to their HQ talking about the RICO’s stuff and the USB key but they started to make assumption about the assault: they thought that marauders wanted to cut them off from the traffic of automatic weapons (the assault was executed with some AK47…) and revealed their impressions to Jones and he thought that it could have been possibile! From here the story took a total twist: PCs started to investigate about the marauders and discovered that the enemy gang made an alliance with a group of gangster (the Lubners) with the explicit purpose of wiping them off from the control of the city! The session stopped here (but they want to continue! ), as you can see many things have changed from the ‘official plot’ but i just followed the players and everybody had a lot of fun. 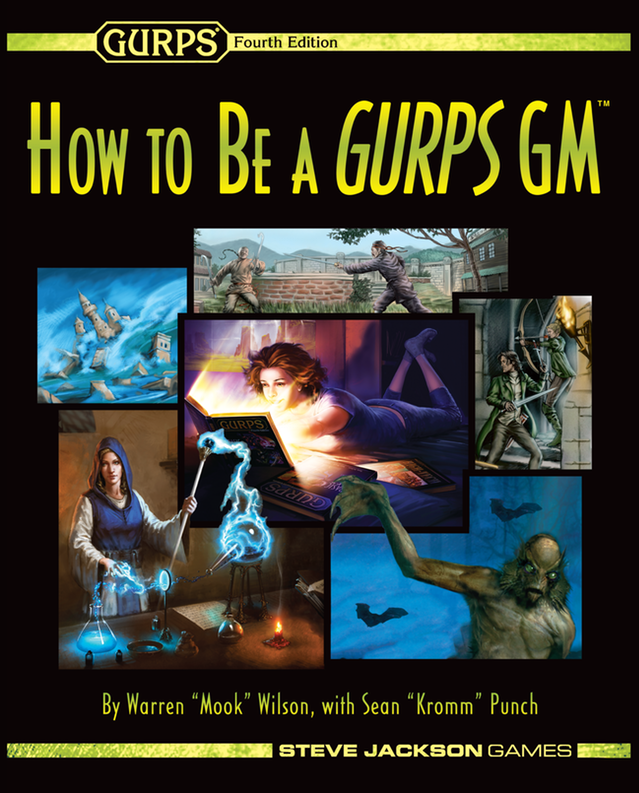 Technically i had the usual issues with GURPS: too many things to track down and being myself the only one who knows (poorly) the rules i often lead the story with a lot of rule-improvisation. There is nothing wrong with this but i am so fascinated by the GURPS (combat) system and every time i’m forced to make strong cuts to the rules just because the others do not know anything about them. As for the rules, is there anything specific you’re having trouble with, or just feeling overwhelmed? I imagine you’ve seen the combat examples and “New to GURPS” posts here. Possibly you could give the players a handout like this (or even simpler — remove Committed Attack, Defensive Attack, Evaluate, and Feint until they’re more up to speed? ), and use the full official GM Screen or a handout like this for yourself? In my vision players need to collaborate to preserve the state of the game, this means that they have to know at least the rules that are related with their characters and at least the basics of the combat. My plan for this is to manage a session a la ‘arena’ (player vs player style) and teach them all is needed. I’m a computer geek so i love to use as much as possibile my mac before and during the game. – Which software do you use to prepare your adventure? 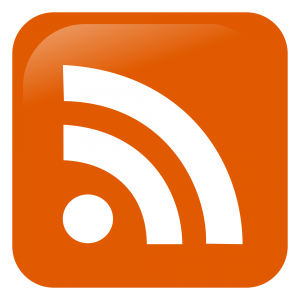 – Which version of character assistant are you using? I did not have a chance to use it yet but i see there are some plugin around (http://www.motoslave.net/thom/gca/phoenix/) and i’m a bit confused. Sounds like the group is in a great place — future looks bright indeed! * I’ll sometimes use a small laptop for background music and/or sound effects (the Warriors game used a lot of this), but generally have it “nearby but not turned on.” One super useful online tool is GURPS Calculator, which is great for figuring things as you go. * I keep notes and organization in Microsoft OneNote, ideally, and MS Word to store game notes and the like. Excel can come in handy too. Photoshop for creating paper figures, logos, weapon cards, etc. 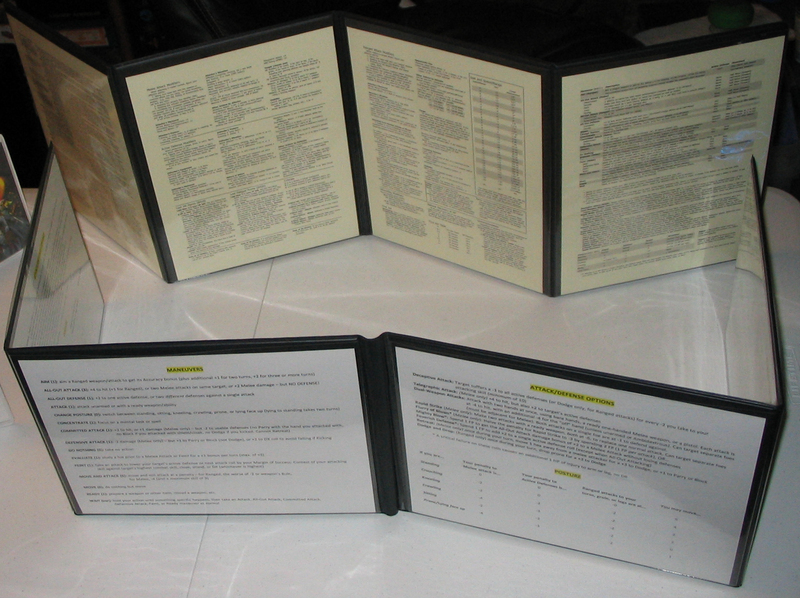 Latest version of GCA for storing characters and printing character sheets. * I’m using the latest version of GCA, whatever that is, though GCS seems decent as an alternative. The Phoenix character sheet is fantastic, but the learning curve can take a while to really sink in. It is amazingly flexible, and you can customize it endlessly, even saving different “profiles” for later use. I have some examples from past games here and here. If you turn on a lot of options, Phoenix works better for GMs and experienced players because, while it’s awesome to have every detail pre-figured and on the sheet when needed if you already know what you’re doing, if you don’t it can lead to info overload. I very often prep two sheets for each character, a full Phoenix sheet and a super simplified one like this.